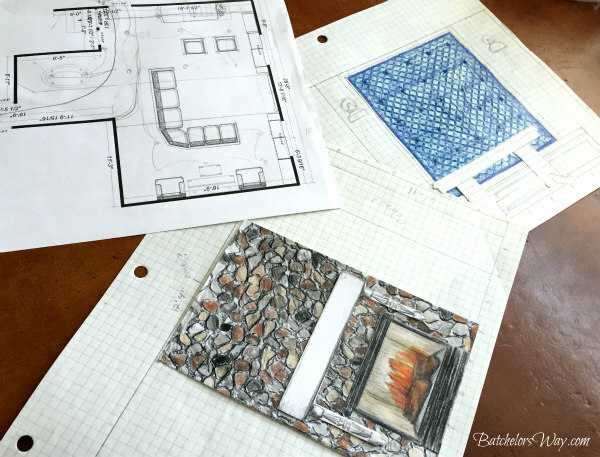 Do you want to see the plan for the messy basement? OK, as always, we made a list of what we were going to store in here as well as the activities we wanted to be able to do in this space. It is actually a very large room. First and foremost, we want to be able to watch TV. Our family takes up all the space on a regular sectional, so I knew we needed a extra long one. OK, I knew this like four years ago. That would be when I found this awesome extra long sectional at the Restore for 50 buckaroos!! You can read all about that adventure in my What's New Around Here Post. We have had this giant sectional for about four years. It is like 9 feet long on one side. It works great and at that price point I don't have to freak if the kids are a little hard on it. That is staying and my plan was totally based around this sectional and TV viewing. Besides watching TV I wanted a space for my artsy kids to draw and play games, and a place for them to play video games. I also want to move the piano downstairs and have a little music area. And last of all I want lots of storage!! I put together a little video to show you my plan. Here is a link to my Pinterest board for this room if you want to see ideas and inspiration for this room. Let's get this room started!! I'm really looking forward to following the process! I've loved the bedrooms, office, bathroom so far. You do a great job! Soon can you do a post about how often you go to thrift stores/ restore. And do you go looking for something specific or just anything that catches your eye. I get inspired by your blog and then get discouraged whenever I go shopping. Seems like the basement is the easiest space to put out of sight and out of mind. But there are so many ideas to make the space more liveable and usable besides storage so I'm looking forward to see what you're going to do with yours! That fireplace looks like an amazing amount of work! And I don't think you have all those stones in storage - how much are such nice rocks going to set you back?